Gary has received nine honorary doctorates and numerous awards for corporate and environmental leadership including a 2012 Lifetime Achievement Award by the US EPA. Previously, he was the Founder of Climate Counts, Director of the Rural Education Center, the small organic farming school from which Stonyfield was spawned and Executive Director of The New Alchemy Institute — a research and education center dedicated to organic farming, aquaculture, and renewable energy. Before that he was a water-pumping windmill specialist and an environmental education director with the US Fish and Wildlife Service. He also authored books on wind-power and organic gardening. This proposal was submitted by Harrington Investments, Inc., 1001 2nd Street, Suite 325, Napa, CA 94559, as lead proponent of a filing group. The proposal has been carefully considered by the board of directors, which has concluded that its adoption would not be in the best interests of the company or its shareowners. For the reasons stated after the proposal, the board recommends a vote “Against” the shareowner proposal. The proposal and supporting statement are presented as received from the shareowner proponents in accordance with the rules of the Securities and Exchange Commission, and the board of directors and the company disclaim any responsibility for its content. We will furnish, orally or in writing as requested, the name, address and claimed share ownership position of the proponents of this shareowner proposal promptly upon written or oral request directed to the company’s Secretary. Information regarding the inclusion of proposals in Monsanto’s proxy statement can be found on page 77 under Shareowner Proposals for 2014 Annual Meeting. Damage to farmers’ reputation, livelihood, and standing in the community. The report shall also discuss the impact of such a policy regarding such issues and related public policies on our customers and consumers, and shall be available by July 1, 2013. Disclosure of material financial risks or operational impacts on the company is required by SEC reporting requirements and we take seriously our responsibility to identify, analyze and transparently report such risks or potential impacts. Existing processes and procedures are in place that are intended to ensure compliance with SEC disclosure requirements relating to the topics raised by the proponent. An additional report to restate such risks or impacts as suggested in the proposal would be redundant and provide no meaningful additional information to shareowners. Our Technology Use Guide, which is updated annually, distributed to our customers and posted on our website, provides information specifically about coexistence and identity preservation to our customers, including general instructions for management of mechanical mixing and pollen flow. We engage in robust, ongoing dialogue with the seed trade, agricultural value chain and academic community to address the complex subject areas encompassed by the shareowner proposal in a manner consistent with best industry practice. These are routinely discussed in these settings and are well known to the company individuals responsible for identifying and reporting material risks and potential impacts. Monsanto is a founding member of “Excellence Through Stewardship,” the agricultural biotechnology industry’s global initiative for advancing best practices in stewardship and quality management. As a member, Monsanto is subject to regular global compliance audits to ensure best practices are being followed. See http://www.excellencethroughstewardship.org/  for more information about this initiative. Constructive coexistence among diverse segments of agriculture is well established and practiced. It is commonplace to find different agricultural production methods working effectively side by side based on well established practices and a long, successful history in agriculture. Careful management of these production methods is in the interest of all concerned – our company, our customers, the value chain and consumers. Farmers and seed companies rely on standards and best practices in seed and grain production, harvest, handling and transportation to support production, distribution and trade of products from different agricultural systems. This is essential to preserve the identity of products to meet market specifications. Examples of identity preserved production include certified seed, specialty oil or protein crops, and crops that meet commercial contract specifications such as organic and non-genetically enhanced specifications. Based on historical experience generally accepted agricultural practices to manage production to meet quality specifications have been established. Among these practices are appropriate seed sourcing, field management, storage and handling practices. This array of agricultural planning tools and practices maintains product integrity and quality specifications. A mosaic of agricultural production systems must be preserved to enable farmer choice and meet global productivity needs. Drought in several major agricultural production regions in 2011 and 2012 is a vivid reminder of the challenges facing agricultural production and food security. Monsanto believes farmers should have the freedom to choose the production method best suited for their environments, markets and needs, whether organic, non-GM conventional, or products improved through biotechnology. All of the agricultural systems can and do work effectively side by side and contribute to the varied needs of different farmers, markets and consumers and meeting the demands of a growing population. Information contained on this website is for informational purposes only and is not incorporated by reference into this proxy statement. Around 15 or so participants carpooled from various parts of the Bay Area to participate in Friday’s all-day peaceful demonstration. Syngenta and city staff anticipated the visitors, who hailed from Morgan Hill, Campbell, Santa Clara, San Jose and San Francisco. Parts of Hecker Pass were previously lined with Caltrans “no parking signs,” while a chain link fence barricaded Syngenta’s parking lot entrance. Four Gilroy police officers kept a watchful eye over the scene from the morning until 2 p.m. Two officers stayed on until 5 p.m. Formally known as “Occupy Monsanto” in protest of the American agricultural biotech company and leading producer of genetically engineered seeds, the gathering marked the final day of a nationwide “global week of action” against “evil biotech” facilities linked to the Genetically Modified Organism food system. Protesters decided to demonstrate in Gilroy since “there wasn’t a Monsanto facility that we could find near San Francisco.” Staging a demonstration at Syngenta is just as legitimate, the group maintained, as the company also breeds, manufactures and sells genetically modified vegetable seeds that ultimately make their way into the food system. While the local Syngenta facility in Gilroy doesn’t actually sell or manufacture vegetable seeds or vegetable plants – it’s a flowers-only operation – the Swiss biotech giant that employs more than 26,000 people in more than 90 countries is currently the world’s No. 2 vegetable seed proprietor, according to its website. Abarca and company protested against Genetically Modified Organisms known as GMOs, as well as the absence of FDA regulations that require GMO food labeling. Biotechnology labeling is not required by the Food and Drug Administration, although it has been adopted by more than 40 countries, including New Zealand, parts of Asia and Australia and most of Europe. Genetically engineered seeds, such as those manufactured by Syngenta, “are tailored for individual geographical regions to be high-yielding and reliable,” as well as “genetically enhanced with built-in insect resistance or herbicide tolerance,” according to Syngenta. Farmers may opt to use these types of seeds, which can be more efficient and yield a higher output. Some common examples of GMO crops include corn, soy beans, sugar cane, rice, cotton, vegetable/canola oil, as well as vegetables that have been genetically modified to remain fresher longer, and thus have a longer shelf life in grocery stores. Arguments against genetically engineered seeds include: Risks to human health and the environment, GMO seeds being too expensive, resistant to weed killer, and genetically contaminating traditional crops – which are important to organic farmers, as well as conventional farmers who export crops to other countries that reject genetic engineering. Syngenta, on the other hand, contends that “genetically modified food and feed products are the most extensively tested and regulated in the entire food sector,” according to Senior Communications Manager Lori Schwind with Syngenta Corporate Affairs, North America. “Testing by independent public authorities and scientists throughout the world, including national and international food standards bodies, continues to demonstrate that approved genetically modified plants are just as safe as conventional varieties,” according to a company statement issued Monday by Schwind. Activists touted signs with messages such as, “We risk becoming the best informed society that has died of ignorance” and, “It’s not nice to fool Mother Nature! No GMO! Yes 37!” in reference to Proposition 37, the “California Right to Know Genetically Engineered Food Act.” The measure to make GMO food labeling mandatory in California is one of 11 statewide initiatives that is on the Nov. 6 ballot. Monsanto and Syngenta are listed as donors to the “No on 37” campaign. Genetic tinkering and the subsequent denial of the public’s “right to choose what we put into our bodies” prompted Campbell resident Robert W. Groff, 58, to participate in the Syngenta protest. Participant’s ages were as mixed as their origins. 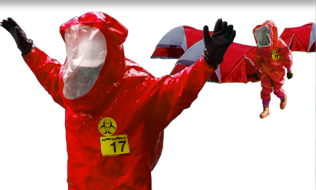 One of the younger protesters included 14-year-old Saul Navejas, who donned a white biohazard jumpsuit. Abarca also wanted to bring awareness to the fact that Syngenta manufactures an herbicide called Atrazine, “one of the most commonly detected pesticides that we find in our water,” he claims. “People need to know what’s in the food that they’re buying,” he rationed. 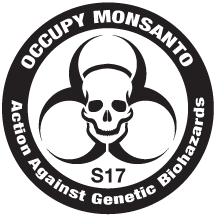 Adam Eidinger, Washington D.C.-based spokesman for Occupy Monsanto, claims studies have linked GMOs in food to autism, obesity, food-based allergies, dropping fertility rates, birth defects and “weird” neurological disorders, according to the Centers for Disease Control and Prevention. It’s a source of deep concern for Morgan Hill resident Loya Jackson, 58, a retired GUSD teacher of more than 18 years. “I am passionate about what GMOs are doing to kids,” says Jackson, who claims asthma, allergies and Attention Deficit Hyperactivity Disorder have proliferated in the classroom. The EpiPen is an auto-injector for the emergency treatment of life-threatening allergic reactions. A former copy editor for the San Jose Mercury News, Bazar belongs to the Women’s International League for Peace and Freedom. 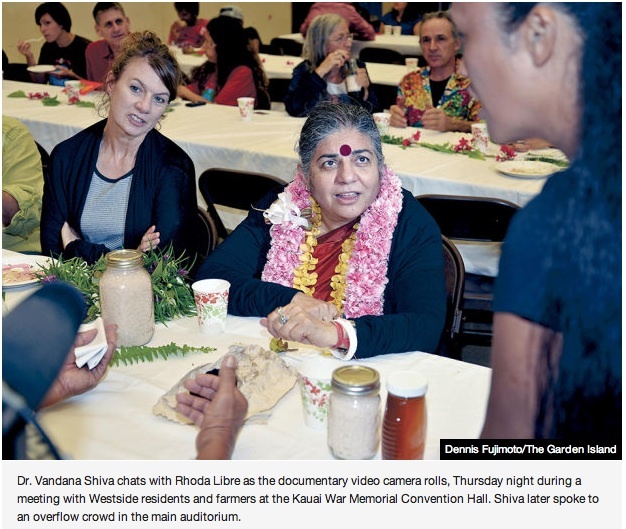 She gathered video footage of Friday’s gathering for a documentary project on the global food crisis. Giant corporations such as Monsanto and Syngenta “crowd out the local food production,” she argues. This article was Monday’s front page story in Metro Boston, a free daily newspaper. Was Metro Boston hoping for a riot? The impact of a demonstration is not about the number of people present, but the number of people reached by the message. Metro Boston missed the point that unlabeled GMOs are hazardous to our health, environment, and future generations. Where have all the BIO protesters gone? Published: June 17, 2012 7:40 p.m.
An international biotechnology conference that once drew thousands of passionate protesters to Boston 12 years ago may only see a handful of chanters during a return visit to the Hub this week. The four day BIO International Convention, a gathering of biotechnology leaders from around the world, kicks off today at the Boston Convention and Exhibition Center in South Boston. More than 16,000 people are expected to attend and contribute nearly $27 million to the local economy. But, as they have in years past, those biotechnology industry leaders will be welcomed by a group of protesters who are planning a rally this morning for the start of the conference. Groups who have expressed their support and plan to participate in the protest include Occupy Monsanto, the Northeast Organic Farming Association and Occupy Boston. 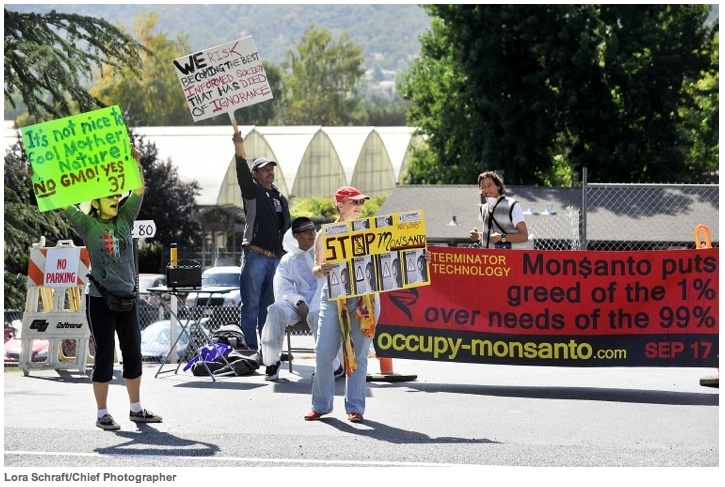 Rica Madrid, a member of Occupy Monsanto, said last week that she expected about 50 people to show up to the protest. As of yesterday afternoon, about 60 people were signed up on the group’s Facebook page to attend today. “We really do hope it’s by the thousands, but to be realistic, I think a lot of people really do care, but conflicts are people’s families. And they don’t have a lot of time to come out to a demonstration on a Monday morning,” Madrid said. She also said a problem to attracting people to the protest is the lack of knowledge about the group’s cause – genetically modified organisms in food. The group hopes to force companies to label food that includes genetically engineered ingredients. A Boston police spokesman said in an e-mail that police are aware the convention “may draw some opposition groups” and that the department has assigned additional resources. Conference organizers said protesters will use a “First Amendment designated area” and that the safety and well-being of convention attendees and Hub citizens is top priority.